Other newly elected office bearers of the High Court Bar Association were also part of the delegation . 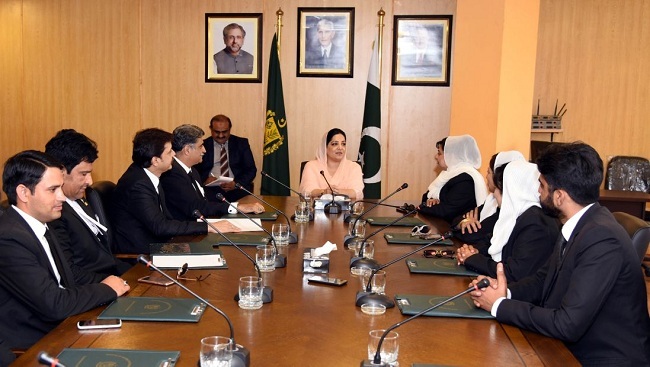 Congratulating newly-elected office-bearers, Anusha Rehman said that lawyers have an important role in the justice system and provision of justice to a common man on daily basis. And I always feel proud to be a part of the legal fraternity. The delegates expressed their gratitude to the worthy Minister for sparing time for the meeting. Anusha Rehman shared some key initiatives of her ministry for development of Information Communication Technologies (ICTs) in the country. She said that our government got national and international recognition and three international awards were conferred upon us on highly transparent spectrum auctions, Telecom policy and global achiever awards on “ICT for Girls” program. We established 150 state of the art computer labs in women empowerment Centers across the country where girls from marginalized sections of the society, are learning latest techniques of coding and cloud computing through Microsoft . We are establishing latest computer labs in 226 girls schools of Islamabad Capital Territory. Besides this we are focusing on under served /un-served areas to provide 3G connectivity through out the country including Balochistan and FATA where even landline connectivity was not available. The delegates appreciated Minister’s initiative in the arena of ICT and asked the Minister to initiate an ICT training program for young lawyers which the latter acceded instantly and directed the concerned authorities. Ameena Sohail Member Legal MoIT and Nasir Ayyaz Director legal, MoIT and other senior officials from Ministry were also present in the meeting.